Actually, ever since Pliny the Elder, the author of most famous version of this story, skepticism abounds about how much of it was true. Nevertheless, if we gently tease apart the loose threads of this yarn we find that it is not without substance. First, there is the location; not just any port in a storm, this region was the site of a thriving glass industry as early as the sixth century BCE, due to the exceptional, pure white sand at the outlet of the Belus river. Archaeologists have excavated ancient glass furnaces at the nearby cities of Tyre and Sidon. 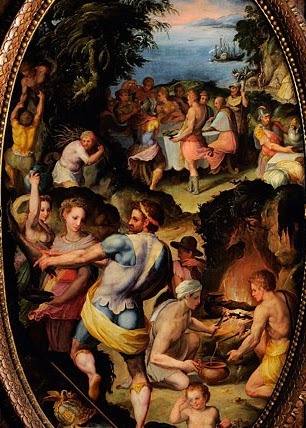 The above depiction of the discovery of glass was painted by Butteri, one of a select group of painters for the Medici court in Florence. The work was commissioned to hang in the secret "studiolo" of Francesco de' Medici, a barrel vaulted room tucked under a staircase in the Palazzo Vecchio in the early 1570's. It was only accessible through secret passages, one leading from Francesco's bed chamber. Another passage lead to an unmarked door on the street and a third passage led to the secret treasury room once used by his father, Grand Duke Cosimo I. The walls and ceiling were entirely filled with paintings, the lower ones concealing cabinets full of oddities of nature, precious gems, coins, alchemical concoctions, and other treasures. Presumably, the cabinet behind Butteri's "Discovery of glass" would house some of the intricate Venetian glass vessels for which the craftsmen of Murano had become world famous. 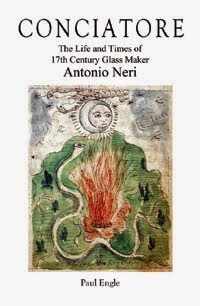 Shortly before the room was completed, a small number of these glass masters were allowed to teach their secrets in Florence by special arrangement with the Venetian government. This post first appeared in a shorter form here on 9 October 2013.